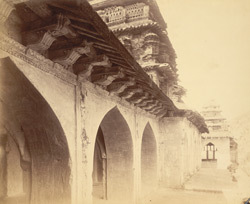 Photograph of the cornice of the Raja Mahal at Chandragiri from the 'Archaeological Survey of India Collections: Madras, 1894-95'. Chandragiri is situated near Tirumala in Andhra Pradesh. The Hindu rulers of Vijayanagara chose Penukonda and then Chandragiri as their new capitals after the sack of Vijayanagara in 1565. They were finally overpowered by the forces of Bijapur and Golconda Sultans in 1659. The Upper Fort in Chandragiri stands on a 183m outcrop of granite. At its base there is a fortified zone that is divided into three enclosures. Within the central enclosure there are two royal palaces, the Raja and Rana Mahal, which are thought to date from the early seventeenth century. The Raja Mahal represents the culmination of Vijayanagara palace architecture. It is symmetrical in design, has three-stories and is topped by a square chamber with a large pyramidal tower. The façade has arcaded openings and projecting balconies. At the corners, there are also smaller towers. This view shows the cornice placed above the arcade on the second floor.